Well....this took me completely by surprise, but it looks like the channel page just got its first overhaul in quite a while. You mean where you have no channel art, no channel icon, and no modules/sections, and all you have is your featured video, your playlists, and nothing else? Well, unfortunately, we were overdue for another unnecessary channel change anyway, they usually happen every couple of years: Beta/2.0 Channels in 2009, 3.0 Channels in 2011, then YouTube One Channels in 2013 . . . yeah, it was only a matter of time it happened again. And do you notice that each time they overhaul the channel design, they basically take more and more away to the point there's virtually nothing left? 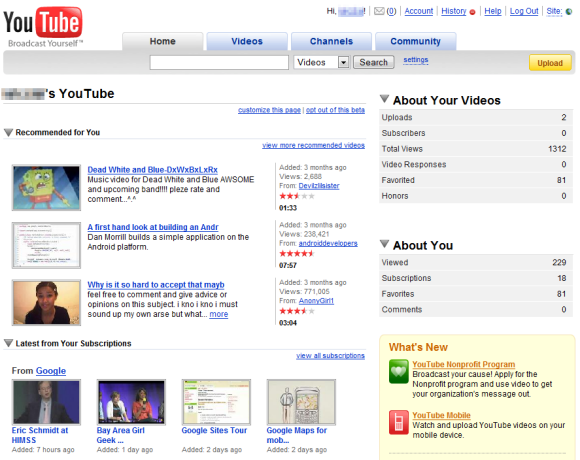 Remember when you used to be able to customize your channel design? Virtually the only customization we had left was our channel art and icon, and we don't even have that anymore. There IS a button on the lower right to restore Classic YouTube, although Big Brother Google really wants you to explain why ( ). Fortunately, there's "I prefer not to answer." Clicked it, and boom, back to Classic YouTube. What they mean to say is "previous version of YouTube." Anybody else get the new look? I have a feeling this'll eventually become permanent. YT's been inconsistent with me. I've still been on the "classic" version for a while now, but there are certain days where they'll switch me to their new version, but by the end of the day when I clean out my cache and temporary internet files, it'll go back to "classic" the next day and stay that way for a number of days. Certainly not looking forward to when the new design is permanent. It's "meh." Not much a fan of changing the avatars to circle borders, which Google probably did to be consistent with all its other services. I do like the new Dark Mode feature, which would be helpful when using YouTube at night. I often surf on YT at night in a dark room, so using this would be a benefit to the eyes. I also wonder if the restore youtube thing will either only be temporary or permanent as well. Oh, jeez. You've gotta be kidding me. Now annotations are going to be retired this coming May in favor of cards and end screens, because they're supposedly outdated and not available on mobile devices, which is the most popular method of using YouTube nowadays. So, um, how will I be able to make notices to viewers about certain things without having to resort to the description box or instilling them in the videos themselves? If a video's sound is off-sync for a brief portion of time, wouldn't it be neater to explain in an annotation than in the description box? How much of the time do average viewers even look at the whole description? Why does YT have this new thing called More Videos now? It's starting to get really annoying already. Fine with me, TBH. Annotations have annoyed the heck out of me in the past - particularly those who tend to abuse them by filling almost every square pixel of the video screen with pointless jabber: "DON'T FORGET 2 LIKE!" "DON'T FORGET 2 SUB!" "DO U LIKE THIS VID? GIVE IT A THUMZ UP PLZ!" "WANNA WATCH ANOTHER 1 ONE MY VIDS?!" In fact, annotations have almost become like those annoying graphic ads you see on TV that always take up the entire bottom third of the screen to hawk whatever other show is coming up next, or whatever product is sponsoring this broadcast, or a channel ID, etc. End screens are less invasive, less intrusive, less annoying, and you can navigate away from the video so you don't have to watch them (whereas annotations always had to be manually turned off on every video). That's how I feel though. Is anyone else really annoyed and irritated with how people will reply to your comments with absolutely nothing to say? They just repeat your name and that's it. Why do they do that? The latest craze now is when they reply with just one random letter (usually 'P'). Apparently there's a Spanish company now called Pongalo OO that's going around and dishing out copyright strikes on shows they don't even own, because they're trying to be Hulu in Latin American territories. Yeah. I often get them on my videos and it's aggravating. They're either little children accidentally leaving comments from hitting random buttons on a mobile device, or they're bot accounts. Either way, I always delete those kind of comments. Now what I want to know is, how do you get rid of channels that only repost other channels' videos? They're spam accounts for sure, and I don't see where you can report them as "this channel is stealing the videos of other channels and adding extra time to them," so is there a way? I seem to especially see comments like that on Sesame Street videos. In fact, those nonsense comments are often the majority. In the last 24-hours, YouTube has wrongfully terminated a countless amount of channels for "multiple violations of community guidelines," among other crazy offenses . . . and a channel that I manage for another group was one of them! And practically the only activity I ever did with that channel since its inception a couple of months ago was the upload of one video, and transfer of ownership to the group's new Google account. No idea what "multiple violations" they're talking about, but I need to get this channel back up and running ASAP, because people are depending on me for it. Looks like I Hate Everything was terminated again, but he's back up now. I swear, Youtube is out to get him. Oh. I hope you get that resolved. If you don't mind me asking, what was the name of the channel you were involved in and some of the other ones that got deleted? So apparently, if you're a smaller channel and YouTube has been stunting your growth, they will actually punish you now for trying to work around their stunting your growth. Since they retired tags in 2013 and smaller channels' videos have been disappearing from YouTube's search algorithm as a result, a work-around for this was adding tags to your description instead, which does get picked up by the search algorithm . . . but YouTube has caught onto this, and has now updated their policies and TOS by saying doing this is considered an act of spam and gaming and tricking the search algorithm, and they will punish you for doing this. So to re-iterate: they stunt the growth of your channel, and if you work around it, they will punish you for it. I quit. I give up. I've been doing this for too long to continue to fight this losing battle, so I'm through. So what are you going to do all about it now? I just told you, nothing, I'm done with it, I'm not up for fighting this losing battle anymore, I'm throwing in the towel, I'm accepting defeat, I'm calling it quits. You're going to give up on complaining about YouTube? I'm giving up on producing content and uploading it to YouTube. Okay, apparently YT's doing that thing again where it doesn't want to load/buffer 720p or 1080p videos that are longer than a few minutes and automatically reloads and rebuffers them at 144p. Apparently now they don't want to play any video over 480p now - even if it's just a minute long. The YouTube mobile app seems to not quite want to play videos in HD for me at all. A bit frustrating but it seems to be stuck at 480p. Still I'm a bit peeved by this.